For a long time, many of us Veterans of the Air Force, Navy, Marines and Army took pride in our handiwork and in our contributions to the aircraft programs we supported, maintained and flew during our years of service. Like all generations, we had our heroes from bygone years that flew many different aircraft during conflicts that would reshape the world. They inspired us with their bravery and dedication to the missions at hand. During my years at George AFB, I watched many a time as F-4s and F-105 Wild Weasels took to the skies day after day. I didn’t think at the time that their profiles would disappear into the history books, along with the stories of those who flew them. 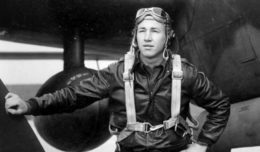 Many of us who volunteered to serve did so not only to honor family legacies, but also because of the inspiration that we embraced from these larger-than-life men and machines that filled the skies in years gone by. Some years back, it became apparent that the air show world with its displays of historical aircraft would find a way to intersect with the front-line aircraft of today. 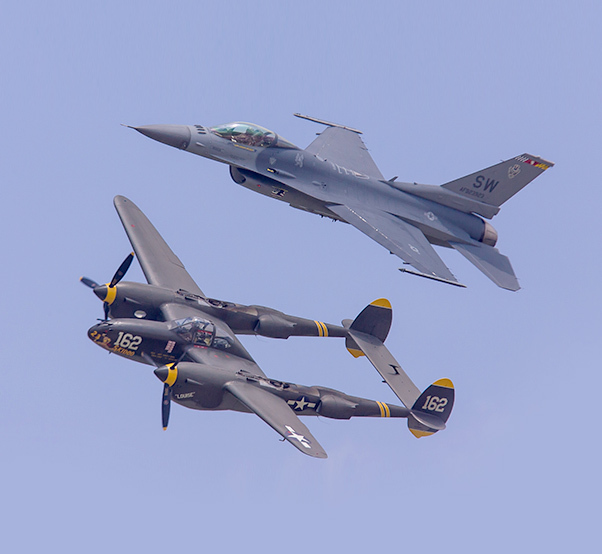 Thus was born the Heritage Flight program, an aerial performance in which today’s U.S. Air Force aircraft are flown in formation with vintage fighter aircraft. These educational and inspirational aerial presentations have lifted hearts and brought a few emotional tears to the tarmac at many air shows across America. For me, the dream to share this spiritual event happened in November 2009 when a group of hard-working volunteers stood on Lancaster Blvd. with thousands of spectators, to honor our Valley’s Veterans with a parade. At 10 a.m., standing at Date Street and Lancaster Blvd., I gave the word to my friend Steve Hinton to start his dual pass down the Boulevard. Appearing from the west, a Lockheed P-38 World War II legend and a front-line-serving F-16 Fighting Falcon flew wingtip to wingtip down the parade route and back. It was a special moment shared by a community and for that brief moment generations of aircraft came together in the skies over the Antelope Valley for all to see. Air show visitors are no strangers to these flights, which have been around for many years, but they did disappear along with many air shows when government funding for these programs fell victim to economic pressures in the recent past. Luckily, the powers that be have seen that many of the American people find value in remembering and honoring the past and the present in such a synergistic way as this. When our nation’s jet teams and heritage programs take to the air, we swell up with pride and our children feel inspired to carry on and rise above and to take pride in not only our country, but in the men and women who for generations served and sacrificed. Soon these aircraft will once again take to the skies over the Antelope Valley at the third annual Los Angeles County Air Show. During that time, history will be on vibrant display with “Veterans” that still live on in the form of these vintage aircraft. – From We Remember by Dwayne O’Brien, the Heritage Flight song.